Philatelic Book "Macao World Heritage"
"The Historic Centre of Macao" was included in UNESCO's "World Heritage List" in 2005. Its unique charm comes not only from the exquisite and magnificent buildings, but also from the history behind the buildings, as well as the local customs and practices, all of which fully demonstrate the universal values of Macao’s multicultural community. 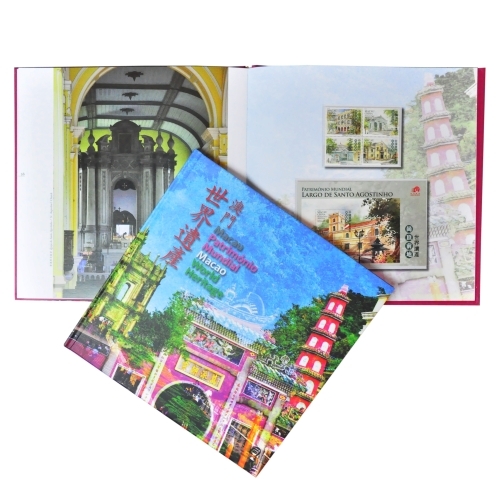 Macao Post will issue a Philatelic Book "Macao World Heritage" on 1st March, 2014. This Philatelic Book consists of 4 stamp issues, which includes: "Macao World Heritage" issued on 16th July, 2005, "World Heritage (Definitive Stamps)" and "World Heritage (Label Stamps)" issued on 31st July, 2008 and "World Heritage – St. Augustine’s Square" issued on 15th July, 2010. This Philatelic Book is priced at MOP250.00 and is available for sale at the Philatelic Shop of Macao Post Headquarters, Rua do Campo Post Office, Maritime Ferry Terminal Post Office, Airport Post Office and the Communications Museum.